Access all areas of the underside of the aircraft at various heights. 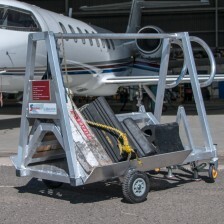 Get high enough to safely stand inside recesses, wheel wells and more, or use the sliding guardrail and gate set for fall protection when working on the outside of the fuselage. 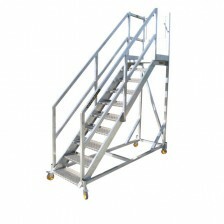 Maneuver around the ramp easily with high grade side-mounted castors, and robust yet lightweight aluminum construction. The handrail allows a worker to safely stand on the top step of the ladder (something they are not supposed to do without a rail). SafeSmart Aviation's products comply with all applicable safety regulations in each country or region they are supplied to. There are representatives available for advice and consulting right around the world, who carry out free site safety audits and provide custom-designed solutions that fit the need perfectly. Occupational Safety and Health Administration - OSHA, USA. the Health and Safety Executive - HSE, UK. Civil Aviation Safety Authority - CASA, Australia. Our products are developed through thorough consultation with our clients. It is your needs that inform our design. But we aren’t just waiting for you ask us to solve safety issues around the hangar. Our representatives are constantly engaged with high-level stakeholders in civil, defense, search and rescue, charter and corporate sectors to identify and anticipate developments in aviation that affect safety and efficiency. These aspects contribute to SafeSmart Aviation’s ongoing commitment to providing in-house designed and built customized products.